When it comes to art, my eldest son takes a quantity not quality approach. In contrast, my second son fills the page, focusing on details and carefully choosing his colours (I’m sure there’s a whole left brain/ right brain analysis to be had there). One of my very favourite drawings is by my second boy when he was four. It shows a day at the beach and apart from the sun and sea, he has included at least thirty people lying on towels at the water’s edge. It’s the little figures on the towels that I love and they immediately sprung to mind when I spotted jewellery by Formia Design. 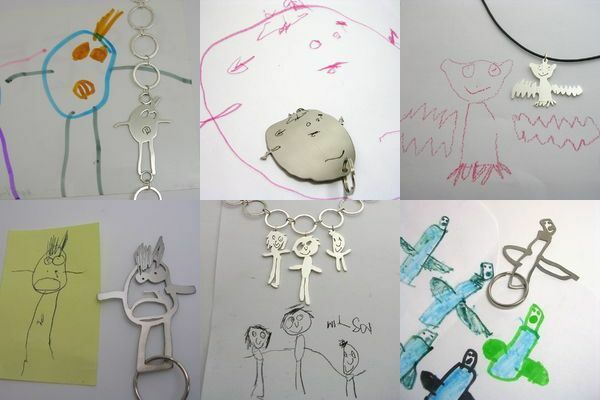 Designer Mia Van Beek creates superb pieces in silver, gold and titanium based on children’s drawings that takes keepsake jewellery to a whole new level. The process is simple – submit your child’s drawing to Van Beek who calculates cost depending on how detailed the artwork is. Van Beek’s interpretations of the drawings are spot on and I’m beginning to think that I might like to be wearing a ‘wonky little person lying on a beach towel brooch’ on my jacket this winter. Titanium keyrings start at US$59. Jewellery pieces include pendants, earrings, cufflinks and charms. Contact Formia Design for further details. 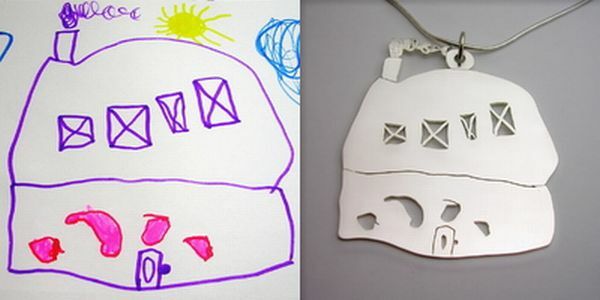 For other ideas on how to preserve your children’s drawings, take a look at our previous posts on bags, lamps and soft toys.